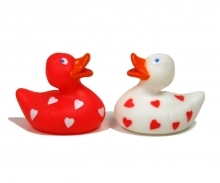 These miniature ducks are sooooo cute, and they are ready to float around in the tub with you. They come in pairs: one white with red hearts, one red with white hearts. Don't let their size fool you (1.5 inch by 1.5 inch), they are full of love and will surely make you and your sweetie smile. Sorry, we do not ship bears, ducks, Love Notes or coupon books outside the U.S.